BNY Mellon is accused of making billions by misrepresenting foreign exchange rates to its institutional clients. 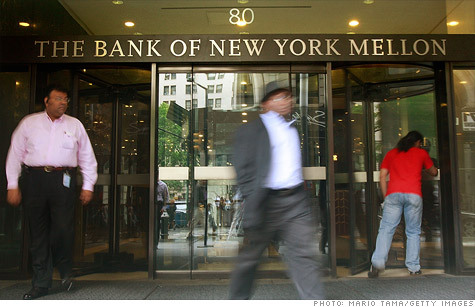 NEW YORK (CNNMoney) -- Bank of New York Mellon is being sued by state and federal prosecutors for allegedly defrauding institutional clients out of $2 billion by misrepresenting foreign exchange rates on transactions it executed for big pension funds. The New York Attorney General and the U.S. Attorney's office in New York announced the lawsuits late Tuesday. The authorities are seeking "hundreds of millions of dollars" in civil penalties and compensation, according to a statement from the Justice Department. According to the complaints, BNY Mellon promised to give clients the best exchange rate available on certain transactions involving foreign securities. But prosecutors claim that the bank used the "worst or nearly the worst" rates of the trading day to execute the transactions. Prosecutors said BNY Mellon was able to profit on the "spread" between the more favorable "spot price" in the currency market and the rate it charged clients. Over a 10-year period, the bank allegedly reaped nearly $2 billion from the scheme, according to New York Attorney General Eric Schneiderman. "Banks are expected to provide a reliable and honest service to their customers," said New York deputy comptroller Ricardo Morales. "Unfortunately, this does not seem to be the case as it relates to the Bank of New York Mellon and their foreign exchange services provided to the New York City Pension Funds." The main victims of the alleged fraud were private and public New York pension funds, according to the attorney general's office. These included retirement funds for teachers, police officers and fire fighters, among others. BNY Mellon is the nation's largest custody bank. It manages financial assets for institutional investors, corporations and high-net-worth individuals. In addition to civil penalties, prosecutors said they plan to seek compensation for BNY Mellon customers. "With an alleged fraud of this magnitude and scope, it is imperative for the United States to seek justice and reform on a broad scale while individual victims simultaneously pursue their own damages," said Preet Bharara, the U.S. Attorney for the Southern District of New York. "The message should be clear --- this conduct will not be tolerated." The charges stem from a lengthy investigation by the New York attorney general's office, which was launched in 2009 after a whistleblower filed a complaint against BNY Mellon. In a statement issued Tuesday, BNY Mellon denied the charges and pledged to "defend ourselves vigorously." "The claims in this lawsuit are flat out wrong, both on the law and on the facts," the statement read. "They reflect a fundamental misunderstanding by the Attorney General and his staff of the role of custodian banks and the operation of institutional FX markets." The bank argued that its clients were given a range of prices for currencies each morning and could choose to opt out of the transactions "if they don't like the range of rates we are guaranteeing." BNY Mellon (BK, Fortune 500) described the lawsuit as a "prosecutorial overreach" that will not benefit the interests of the state employees the Attorney General "purports to advance." "While we recognize that capitulating to the Office's demands might avoid some nasty headlines, we refuse to be coerced into admitting to and paying for wrongdoing that does not exist," the bank said.